This night is two months overdue. 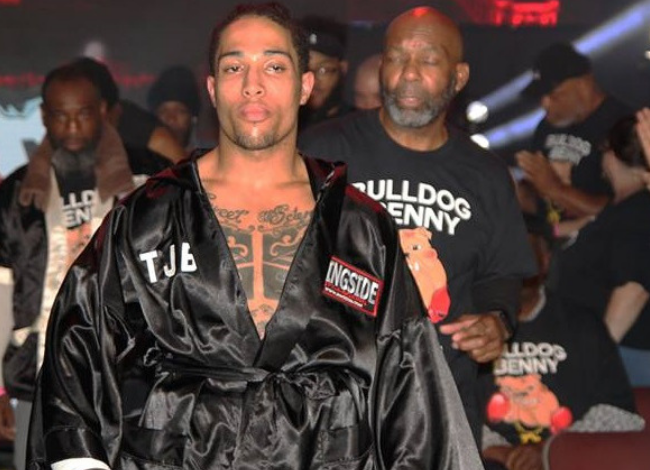 Benny Sinakin, the “Jewish Bulldog,” the former Golden Gloves champion, was supposed to be here at the 2300 Arena, making his professional boxing debut on Aug. 11. Friends and family cleared their schedules to be in South Philadelphia, and his father, Lincoln, started a group text message for the occasion. He forwarded the group a promotional poster. “Wow..look at little benny …little no more..wow,” one response read. But then Benny Sinakin’s blood pressure skyrocketed, and he failed his pre-fight physical. It was probably jitters, Lincoln Sinakin said, and the fight was pushed back eight weeks to Oct. 6. This time, Benny Sinakin passed the physical, and he arrived at the arena around 5:30 p.m., nearly three hours before the fight. Here’s what happened behind the scenes of one of the biggest nights of his life. 5:45 p.m. Boxers on the seven-fight card, which is promoted by Hard Hitting Promotions, are divided into two dressing rooms — the “blue corner” and the “red corner.” Father and son set up camp in a small room in the corner of the latter. They’re joined by George Hanson, Benny Sinakin’s publicist. Hanson is also working as an announcer tonight, and he looks the part: gray dress pants, white button down and suspenders. Benny Sinakin pulls up a chair next to Hanson and extends his arms. Hanson is the only person he trusts to tape his wrists. 6 p.m. Hanson is still going. Wrist taping is an art, apparently, and Hanson is Benny Sinakin’s personal Picasso. He takes great care in the wrapping, his eyes not leaving the wrists. Billy Briscoe, a local trainer with a long beard and grizzly voice, is regaling the room with old war stories: “The old timers, they didn’t drink no water!” Benny Sinakin laughs. He bops his head to the hip-hop music playing through his oversized headphones. His back faces a mirror, which reveals the back of his T-shirt. “THE BULLDOG ALWAYS DELIVERS,” it reads. 6:10 p.m. Hanson has to leave. He’s being called to do the preshow introductions, but he isn’t finished taping Benny Sinakin. He rises, grabs his jacket and shoots Lincoln Sinakin a concerned look. Briscoe says he’ll finish the job. “You good, Benny?” Hanson asks, repeatedly. Benny Sinakin nods his head, “Yep,” he says, unmoored. 6:30 p.m. All of the fighters in the “red corner” dressing room are called out of their respective rooms for a rules presentation. The competitors huddle around a referee. Benny Sinakin stands among them, another fighter in the half-circle, listening. Except he’s not just another fighter. 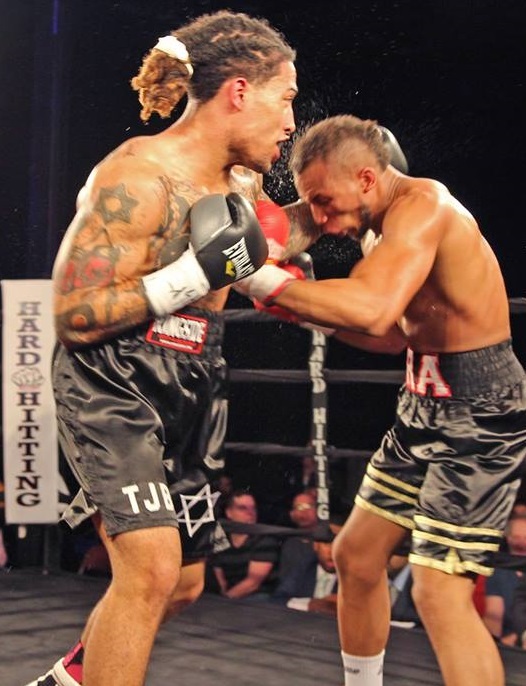 He’s the only boxer on the card making his professional debut and a bad result could stymie his career. “Fellas, punching behind the head, rib shots, low blows — you’re professionals, we expect you to act like professionals, all right? Keep the fight clean at all times,” the referee bellows. 6:55 p.m. Benny Sinakin shadow boxes for a few minutes, punching the air, then sits back down. Old friends and trainers filter in and out of the room, and everyone calls each other “champ.” Hassaan “Candyman” Williams, one of Benny Sinakin’s trainers at the Marian Anderson Recreation Center, notices that Lincoln Sinakin is wearing a red Hawaiian shirt. “Pops, where’s your bulldog shirt?” Williams asks. 7:17 p.m. Father, son, Williams and cut man Vincent Jackson place their arms around one another. Lincoln Sinakin sings the shema, then Benny Sinakin says a prayer of his own. 7:50 p.m. Benny Sinakin makes his way down the stairs and sits at a chair behind the curtain, flanked by trainers and friends. He watches the end of the previous fight on a nearby television screen. Loud music blares in the background. 7:58 p.m. Benny Sinakin bounces up and down and makes for the curtain. He stops at the TV, which shows the tale of the tape for his fight. He glares at the headshot of his opponent, Alex Lara, who brings a 1-0 record into the fight. “He’s in your way, Benny, he’s in your way!” Williams shouts. “I am blessed” by Mr. Vegas fills the arena, and the boxer makes his way down to the ring to the roar of the hometown crowd. A supporter waves an Israeli flag. Lincoln Sinakin sits a few rows back, watching. 8:03 p.m. Ding Ding! The first round starts and Benny Sinakin is on the offensive. Within 30 seconds he backs Lara into a corner, pounding away at his opponent. Lara dodges and breaks away. The round ends, but not before Benny Sinakin lands another big punch. The crowd explodes. “That’s my son!” Lincoln Sinakin says to a fan. 8:13 p.m. Benny Sinakin connects with a thunderous blow to Lara’s face. Lara falls. The third round ends before the referee can complete the 10-count. 8:19 p.m. Benny Sinakin stands in the middle of the ring, body glistening in sweat, his arm raised in victory. He wins via unanimous decision. He leaves the ring, suddenly bombarded with hugs, attaboys and selfie requests. I really enjoyed the video and the reading of the whole thing line for line. Great work and great job on his debut fight. Continue to do great things to you both.